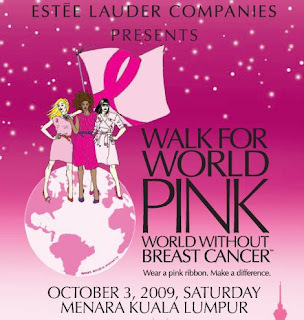 Wendy Pua | Malaysia Chinese Lifestyle Blogger: "Walk For World Pink"
Estee Lauder is organizing the Walk for World Pink, World Without Breast Cancer on 3rd Oct 09. Come and register yourself to this event! A very meaningful events for all women!!! What's more?? There will be a goodie bag worth RM 100 given out upon completion of the walk!! 1. The race is open to all participants of age 13 and above as of 31st December 2009. 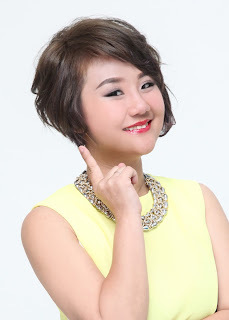 Children aged 12 and below can accompany their parents but will not be eligible for the goodie bag and T-shirt. 3. The registration closing date is at 5pm 14 Sept 2009 or upon reaching 1,200 participants whichever that is earlier. 4. RM30.00 for participant age 13 and above. There is RM3.00 transaction fee for online registration. I had already registered for myself & my hubby! Hope to see you gals there! !